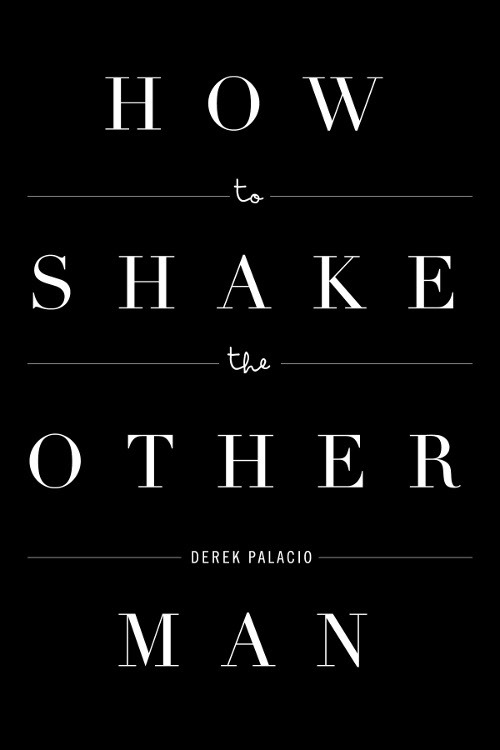 How to Shake the Other Man, by Derek Palacio. Nouvella Books. 63 pages. $11.00, paper. Derek Palacio’s debut book, Nouvella Book’s most recent, is top notch and reaffirms everything I’ve already thought about the in-between novella form. How to Shake the Other Man is a beautiful meditation on love, brotherhood, identity, and boxing. Palacio, who has a story forthcoming in The O. Henry Prize Stories 2013 collection, has staked a claim for himself, emerging as one of the freshest young voices to come out of the fiction landscape in years. There’s plenty to gleam from this book despite its size. The shifting tenses, the emotion that is bubbling just beneath the surface, sort of rippling on the edge of the precipice, the simplistic beauty of several complex relationships, the identity issues (be it cultural or sexual), this book has everything one could hope for. Palacio’s deft ability to shift back and forth within the constructs of a multi-layered tale belies his youth. He shifted back and forth between the past and the present like a prizefighter tiptoeing around his opponent in the ring, waiting for the right moment to change course and catch them off guard. Just as I was getting a hold of the present storyline Palacio would throw an unexpected left hook and drop in a scene of backstory, adding a tier of complexity to the already finely woven narrative. The book begins and ends with scenes from inside the boxing ring. Although the text is anchored by the lonely and unrelenting world of boxing, it’s the relationships between the characters, a portrait of brothers, an insight into two lovers, and the death of one of the brother’s that forces the lover and remaining brother to re-examine their own relationship that serves as this book’s motor. As these relationships unfurl and the particulars are untangled things get messy but the underlying beauty of the humanity that Palacio exposes within these relationships pushes the book forward at a pace similar to that of a classic heavyweight match. Each page, each section gaining momentum, feeding off the last forcing the reader to sit up a bit more, to pay attention so as not to miss a key sentence or phrase feels like I was sitting front row for a Tyson bout in his heyday. Blink and you’ll miss the magic. Get up to go to the bathroom and you’ll miss his opponent bouncing off the canvas, mouthpiece flung out into the stands. In many ways the boxing metaphors are bigger than the book itself. Just like many took Tyson’s dominance for granted, didn’t appreciate the degree of difficulty, the multiple aspects that he balanced and honed to a razor sharp edge, it’s easy to fall in with Palacio’s narrative and completely forget, or dismiss, his level of skill. Even if this short book is a sprint rather than a marathon it doesn’t take away from its grace, the skill needed to execute it. Palacio has honed his craft here and by the end you’re left much like an inexperienced boxer after a match: tired, dazed, confused, and not quite sure what just happened to you but knowing fully that you can’t wait to get back in the ring and do it again. The story felt as though it could’ve been strung out into a full-length book but that’s the beauty, and challenge, of a novella I suppose. To be able to compact feelings and scenes and a narrative arc enough to keep it at sixty odd pages but to be able to include enough extra brush strokes so as to illuminate the story with the proper amount of nuance. This balancing act, this situation which is usually only discussed if the author fails at it, is what makes this book so good. Besides being a gripping story with memorable and unique characters, Palacio has taken the nuts and bolts of storytelling and massaged them so as to help further the story along rather than impede it. Like an underdog, long shot no name boxer, this story refuses to silenced, waiting for the right moment to strike and show that even the smallest of books can pack quite a punch. Palacio’s sense of language, his ability to use the right phrase at the right moment and the equally difficult job of knowing when to back off, when to let the silence envelop the reader is a rare find nowadays, especially in a debut book. How to Shake the Other Man is a beautiful elegy to family and brotherhood and love. Palacio’s exploration of the dichotomy between immigrant minorities trying to find, and place themselves within a cold and foreign environment and the machismo of the world of boxing and the relationship between brothers is what gives this book friction. Sparks virtually fly off the page, igniting his prose in a multitude of meanings depending on reader. I finished this book in one sitting. Read it straight through. It’s on my shelf now but I suspect that it won’t stay there for long. It’s only been a week and already I’m itching for another look, another peak to see if I missed some hidden gem. That to me, is what a good book is. That want, that need to re-read it. The only thing better than reading a good book is reading one from a new author. Take my advice and keep Derek Palacio’s name stored in your head for the future. Chances are you’ll be hearing more from him, a lot more. How to Shake the Other Man (soon) at Amazon.com. How to Shake the Other Man (soon) at Nouvella Books. Patrick Trotti is a writer, editor, and student. On good days it’s in that order. For more go to patricktrotti.com.